Celeste Smucker has been a professional writer since 2001. She is a features writer for "The Real Estate Weekly" in Charlottesville, Va., and a citizen journalist for NaturalNews.com. Smucker holds a Bachelor of Arts in sociology from Macalester College, a Master of Public Health and a Ph.D. in economics from the University of Michigan. Nighttime itching is common among people who experience itchiness during the day, regardless of whether the cause is dermatological or systemic. A 2007 review article on this subject by Tajesh Patel, et al. says that as many as 65 percent of daytime sufferers report their symptoms worsen at night. Night itching, also called nocturnal pruritis, can cause you to scratch while you sleep, inflaming your skin, exacerbating your symptoms and leading to sleep loss. 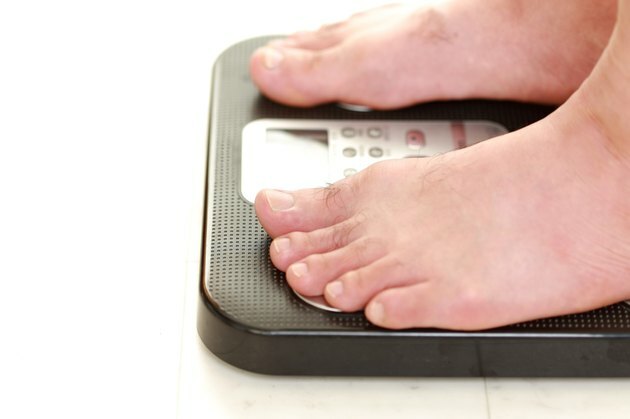 Since sleep loss has been positively correlated with weight gain, it may be a crucial link between nighttime itchiness and obesity. Consult your doctor about a diagnosis. Patel's article cites several studies connecting nocturnal pruritis and sleep loss. In one of these, children who experienced nighttime itching lost an average of 46 minutes of sleep per night. Adult study subjects slept less, woke twice as often and stayed awake longer compared to controls. Some consequences of nighttime itching are fatigue, depression, agitation, changes in eating habits, reduced concentration and a diminished quality of life--any of which may have an impact on your weight. Studies show a connection between sleep loss, weight gain and insulin sensitivity. A 2010 review article by scientists at the University of Chicago reports that sleep deprivation in healthy volunteers caused increased insulin resistance leading to impaired glucose tolerance and an increased risk of diabetes. Sleep loss can also contribute to a decrease in leptin, the hormone which signals your body that you are full so that you stop eating, and promotes an increase in ghrelin, a hormone that stimulates your appetite causing you to feel hungry and eat more. Itchiness contributes to diabetes risk, and diabetes may increase the chances of itchy skin conditions. According to the American Diabetes Association, diabetics are prone to many of the same skin disorders as non-diabetics but they get them more easily. The list of skin conditions aggravated by diabetes includes localized itchiness due to yeast infections, dry skin or poor circulation. Other disorders common in diabetics are vaginal infections, jock itch and ring worm, all fungal infections caused by the yeast candida albicans. There are not a lot of effective treatments for nocturnal itching. While antihistamines are sometimes recommended, Patel suggests their main effect may be to promote sleep rather than prevent itching. Since moisture loss from the skin may contribute to itchiness, moisturizers may help by minimizing evaporation. Patel recommends using products with a low pH since they will also strengthen your skin's barrier function. As nocturnal itchiness may result from interruptions in your body's biological clock, bright light therapy and melatonin which have helped shift workers and people with jet lag may be worth a try, Patel says. Consult your doctor before trying new remedies or supplements. Why Are Shingles So Painful at Night?